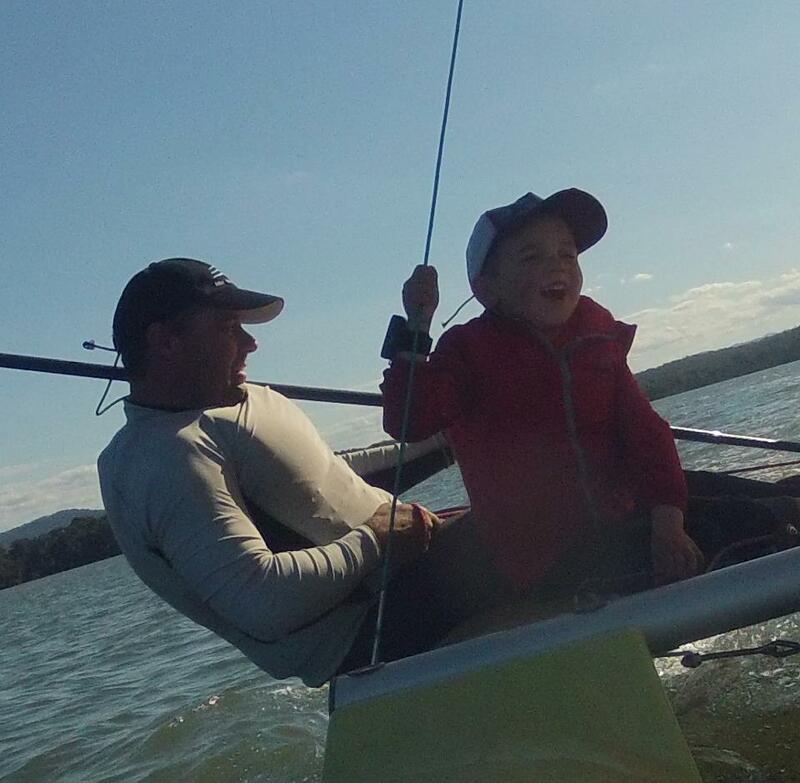 Had to share these as this is what it is all about Father & Son having a great time out on the water together. This is my mate Rohan with his 4 yera old son Charlie, out sailing there 14ft Maricat together just for fun. 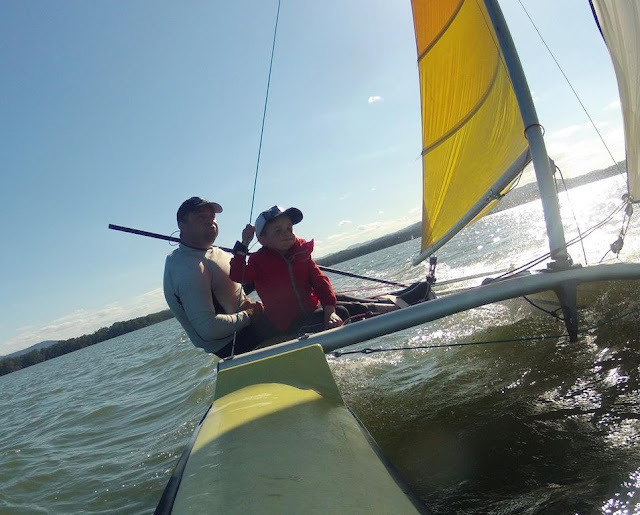 Rohan is a world class sailor in the NS14 fleet (I know half boat) but also has the Maricat for those family fun days. The next Jimmy Spithill maybe or the start of an Olympic campaign? 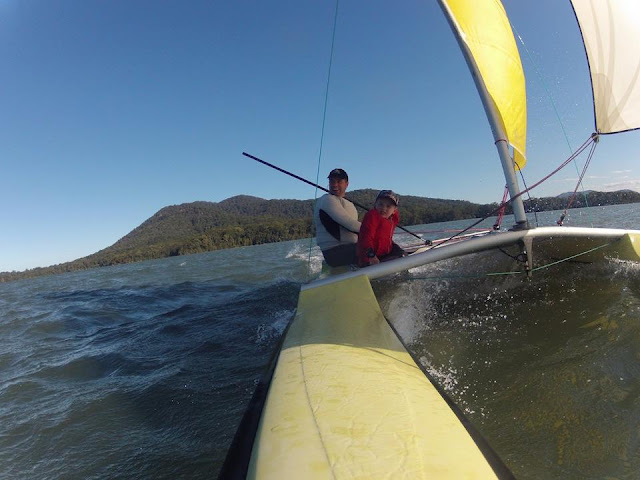 Bendigo Yacht Club and AHPC are joining forces to offer sailors a series of “Cat Camps” over this coming season. 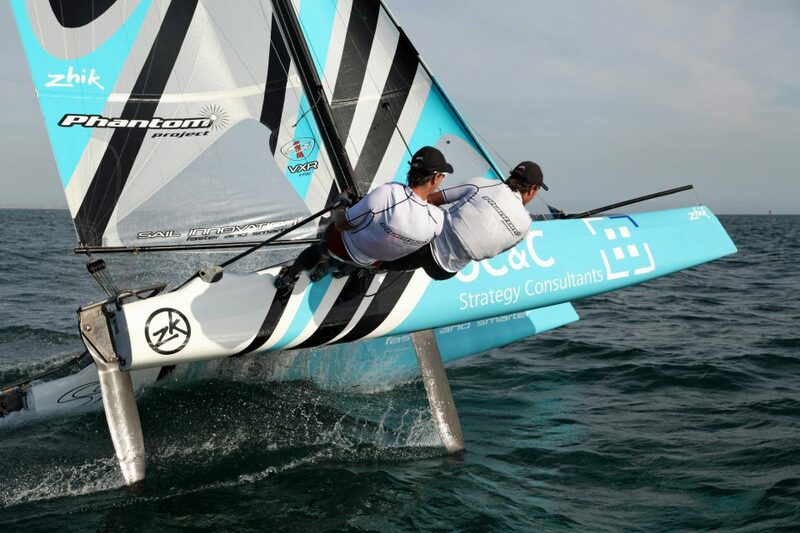 The leading coach for these programs will be Greg Goodall who is now keen to pass on his wealth of knowledge to sailors. Each Cat Camp will have a limited number of participants to enable some intense individual training. 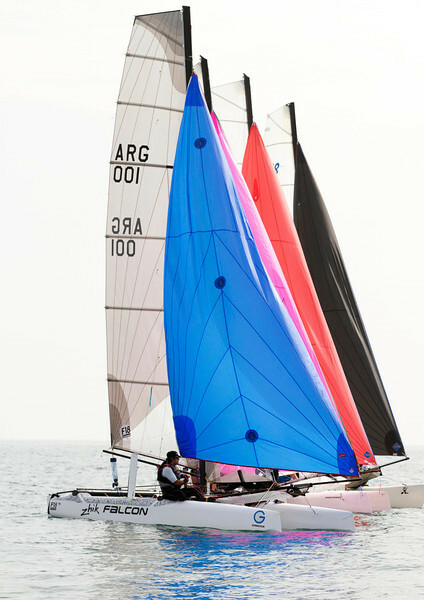 Programs will vary according to the participants, but include all facets of catamaran sailing from boat set up to racing tactics. AHPC & Bendigo Yacht Club will have some boats available (Vipers, C2’s, Mossies, Paper Tigers) for those participants who need to travel some distance. Airport pickup can be organised. 1. Reply to this email by completing the questions below. 2. Distribute this email through your club or class association. 3. Forward this email to any sailors you think maybe interested. CAT CAMP – Friday 9th to Sunday 11th November – Take the Friday off and make a long weekend of it. Arrive and be fully rigged by midday Friday, ready to hit the water for the first coaching session Friday afternoon. This camp will be fully catered for from Friday lunch to Sunday lunch. Participants will need to organise their own accommodation. Camping will be available at the Yacht club. Depending on interest, this camp may be repeated on Friday 30th November to Sunday 2nd December. This camp can be repeated for a particular class of catamaran if we have sufficient interest from a particular class. ADVANCED CAT CAMP – February (date to be confirmed) – This will be a 3 day camp specifically designed for those sailors who wish to compete internationally in either the F18, F16, Viper, Nacra 17 or A-Class. Numbers will be strictly limited. Vipers & C2’s will be available for those who need to travel some distance. This camp will be fully catered. Participants will need to organise their own accommodation. Camping will be available at the Yacht club. 2. If so, which one? 3. What class of boat do you currently sail? 4. Would you like to be emailed any information regarding future “CAT CAMPS”? 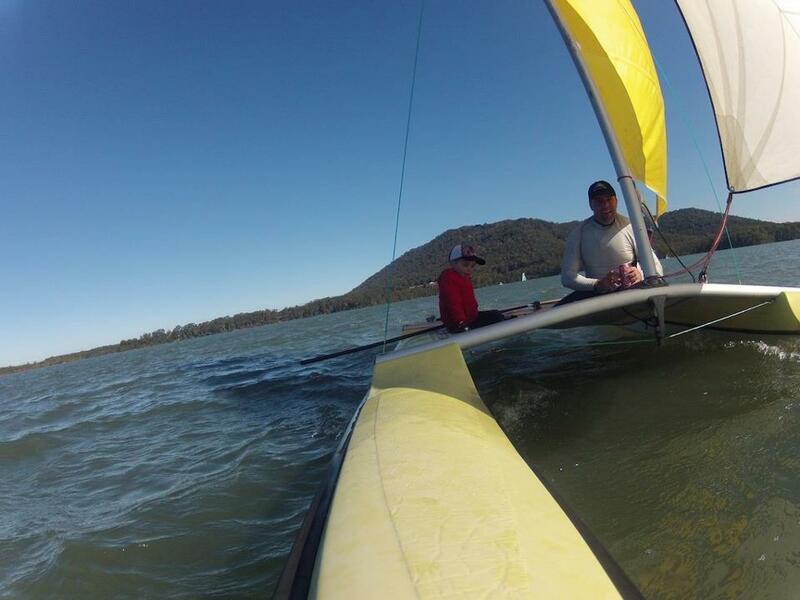 The count down is on for the season starter, The 2012 Forster Wild Cat Regatta at the Great Lakes Sailing Club in Northern NSW. The regatta kicks of on Saturday the 29th September till the 1st October. If you are only going to one regatta all season, hell this is it! This is the one regatta that everyone attends and everyone loves. The past couple of years it has rained but you still come away with a smile on your face going that was fun. 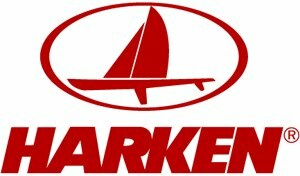 Team Harken rigging up last year. 300m of beach chocka block with beach cats of all sizes and classes. The regatta in it's hay day during the 80's we use to see 250+ beach cats trying to rig up on the beach, with the insurge that we have seen of both old sailors returning and new sailors taking up beach cat racing the numbers will slowly start to climb back up there again soon. I can see a three figure fleet hitting the water this year. It's a great time to be part of it all again. 2012 Globaltech F18 Worlds, and the winner is? 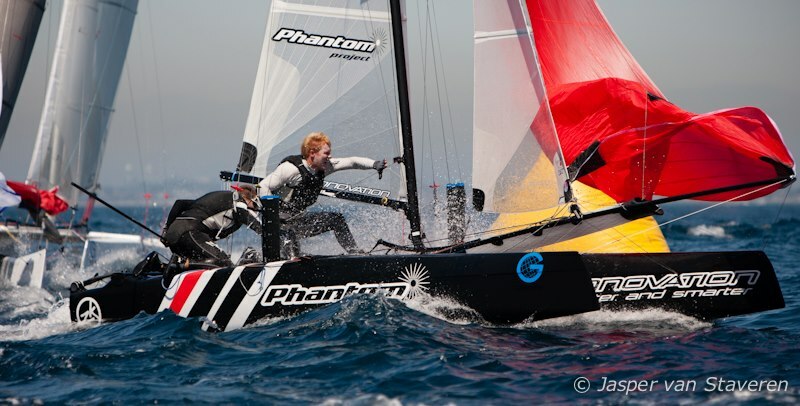 The French team of Oliver Backes & Matthieu Vandame sailing the SI Phantom. Great job boys. Sounds like it was a very successful regatta and everyone went away happy. I personally thought Hugh Styles would have had a chance of winning but a couple of small stuff ups and it hurt him big time, no worries buddy you and me next year in Tuscany ITA can be fighting it out for the top spots. Thanks to all the guys for sending the photos and reports though on Facebook each day, great job guys and girls. The F18 Worlds are currently going down in Long Beach CA. From the reports I'm getting it sounds like the first day of racing involved some very light airs but looks like the top teams still came to the forefront. Light & tight - photo: SurfCityRacing. Leading currently after day one is Carolijn Brouwer which is very cool to have such a talented chick leading. Shows how well balanced the class is that no one boat is better or it being a male dominated class.